"Understanding Television" & "Understanding Time"
Part of Discovery Network's Understanding series, these 60-minute documentaries ran on The Learning Channel. 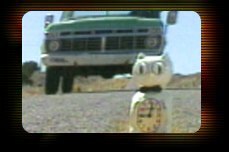 Ned Judge produced several programs in the series, and we were able to provide some special shots that helped tell the stories of 'time' and 'television'. We had fun bringing to life some of Ned Judge's visions. Shots of clocks being smashed and run over. It's interesting to spend hours tweaking a shot - and see it go by in a couple of seconds in the finished program. But so often it's these moments that really make a project work on screen.